Creating a Referral Campaign has never been easier than this. See how we can get your campaign active in under 10 minutes. See how this screenshot of an existing campaign on the platform, depicts its all-inclusiveness. This campaign has 3 rules. Upon the referral, it rewards the Friend an incentive of 100 Rs when he signs up with the app. Additionally, it rewards the Referrer and the Friend a sum of 50 Rs when the friend makes a transaction on the app. You can add any number of such rules. Take a look at how you can create a Basic reward rules. If you choose to reward upon a Transaction, you would need to add a minimum transaction amount too. This allows you to ensure that you are not burning out more cash in incentive than what you are making the user spend. A cool marketing hook, ain’t it?! You can also set the Frequency of this reward – Only Once, Always or say ‘N’ number of times. That just makes the campaign juicier. And we know this is a feature you would love. You can also define a number to the days you may want to keep rewards before they are distributed to the beneficiary. This is applicable in cases that might involve any returns on a transaction done. As described above there could be multiple ways of defining rules for your campaign. AppVirality gives you the flexibility to set different sharing text/copy for each type of social channel. You can do this from the campaign modification/creation page. Remember to keep an eye on the Display Order against each social channel when you edit them. This number determines in what order they shall show up in the Share Intent Screen inside your app when the In App Referrals are launched by the end users. You can also customize the text that gets shared across each social channel, right from this panel – individually for each social channel. Though we provide most of the famous social networks on AppVirality dashboard which you can configure for using as a sharing option inside your app’s referrals but as there are so many of them and we can’t possibly include all of them so we have come up with a new feature called Custom Social Actions. They serve mainly two purposes, first, to include a new social action for your campaign which is not already provided on the dashboard and second, to customize the implementation of your custom social actions, where you can define what should happen when a user clicks on a custom social action. Know more on Configuring custom social channel. You can see the preview of how a referral invite will appear on social networks once a user shares it, which would help you in configuring the proper title, description and image for the social channel. You can see preview for various social channels like Facebook, Twitter, Whatsapp, Messenger, default and custom social channels. 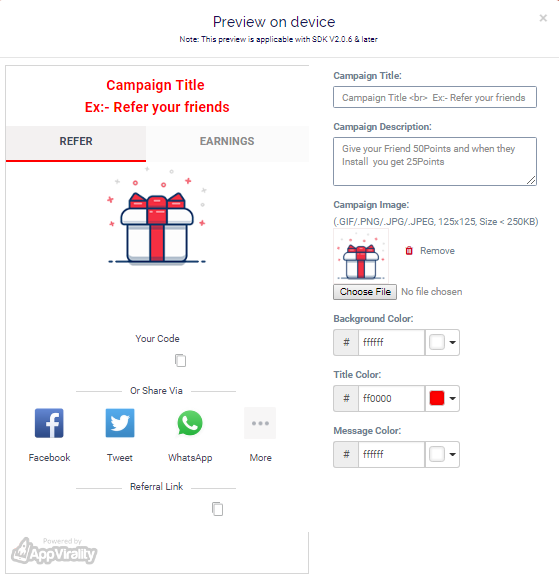 Once you are done with everything, simply click on the Preview on Device button and see your campaign’s preview. 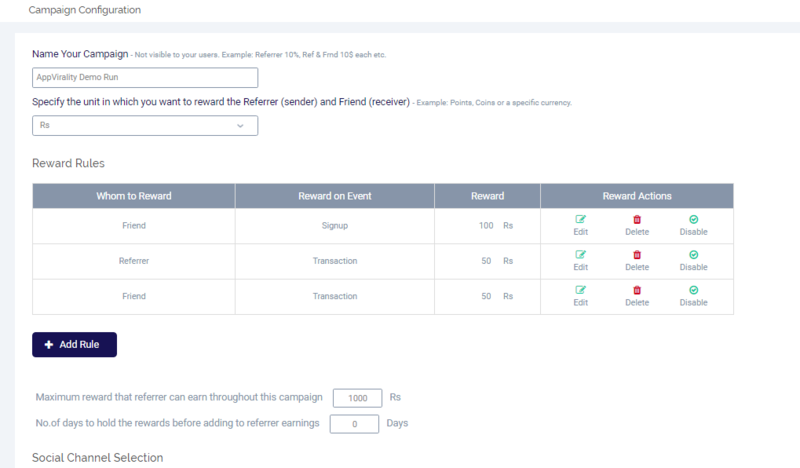 AppVirality supplies you with a pre-designed referral screen – all with social channels displayed as per your defined order & text in conjunction to your reward rules. You can edit the text, background colors, font color, etc. and add a campaign image to modify this. You are allowed to use common styles like Line Breaks (i.e. <br>) and Bold (i.e. <b> content </b>) tags in the Campaign Title & Campaign Description fields, for customizing the look of your content within. Once you are done, Save Campaign and get ready to Publish it from the App Details page.